Brushing your pet’s fur isn’t just a maintenance issue, it’s a necessity! Brushing helps keep pets clean, eliminates excess shedding, and serves as a wonderful bonding experience for you and your favorite family pet. No matter how much fuzz your pet produces, a little brushing can go a long way. Dogs are not exactly what you would call cleanly animals. Therefore, it becomes necessary to engage in some regularly grooming. For short haired doggies such as Doberman pinchers, greyhounds, or Chihuahuas this isn’t such an imperative. However, if you’ve ever owned or know someone who’s owned a Siberian huskie, border collie, or a Lhasa Apso then you’ll also understand the apocalyptically fuzzy nightmare that awaits you if you miss even a single scheduled session of brushing. So there are a few things you need to consider before smoothing out those rampant tufts and tangles in your beloved mutt. First among these considerations is the question of which brush to bust out? If you’ve got a pooch with a long, flowing, smooth coat that looks like it could be a candidate for a L’Oreal commercial you’ll need a wire pin brush or something with some softer bristles, depending on your preference. Softer and shorter coats do better with closely set soft or medium grade bristles. A tramp like coat that’s all matted and scruffy is going to require short firm bristles that are again spaced closely together. If that doesn’t keep your pup covered then you might need to seek out some professional grooming advice. In fact, that’s probably a good idea either way. 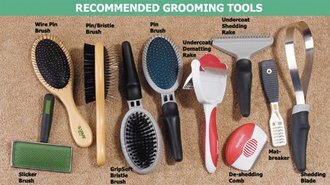 Ask your local veterinarian or groomer what sort of brush they would recommend before breaking the bank on the super specialty brush you read about in Dog Fancy magazine. and how long to continue. Start at the dog’s head and be extra careful here, because your pup’s skull is the most sensitive part. And you may need to avoid the frisky mutt’s bite as they might think that brushing is a new game, if they aren’t used to the idea. Start at the head and work your way down the body until you get to the legs and tail. Then do those individually in any order you choose. Going against the grain is usually reserved for those shorter finer coats that won’t pull so strongly against the dog’s skin. 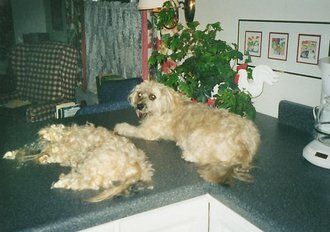 However double coated dogs require both: with the grain for the top layer, and against to get those hard to reach bottom hairs. As for how long you need to keep this up, that’s entirely up to how clean you need your dog to be. Some mutts can be brushed for hours and still have plenty of fur in reserve so use your best judgment and get to work! Thanks for this information Zack. My dog has a double coat which is hair and wool. It's a nightmare to brush and it's really hard not to pull her skin, and I know it hurts her by her reaction. I got a few useful tips from your blog, such as what brush to use and how to brush the coat, and it's very much appreciated. Does anybody know of a reputable detangling spray that might help OR does anyone have an organic recipe that I can make up at home? I don't know if this would help but it's worth a try if it cuts out a bit of my dogs pain. Brushing should be enjoyable but for me and my dog. Its anything but! I hate hurting her!!! Try using a lot of dog conditioner. It will make their hair silky smooth and a lot easier to brush. Not to mention sooo good for cuddles afterward.